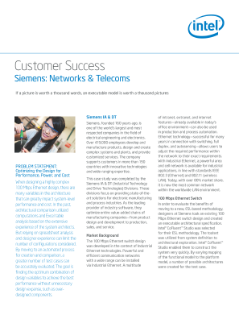 Success Brief: Siemens develops telecom design models using Intel CoFluent™ studio and an existing 100 Mbps Ethernet switch, optimizing performance. See how to eliminate the guesswork for development of systems and IoT and big data applications. See how you can optimize resources by simulating real-world performance to assess data center needs. See how to eliminate the guesswork for development of systems and applications; Japanese version. This technology provides businesses with the right infrastructure to reduce waste, innovate systems, and transform potential. Get system-level modeling that can predict performance, optimize resources, and calculate costs based on hard-tested data. Hardware-enhanced security features enable enhanced identity theft protection for more convenience and better security.